Tonight Sher and I shared a theater full of fellow baby boomers in order to hear from an old friend. 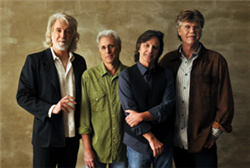 The Nitty Gritty Dirt Band gave a one night concert at the Edmonds Center for the Arts (ECA) as they are wrapping up their 2014 tour. Press releases and the NGDB website itself refers to the band as “iconic” and a catalyst for American Rock. Since 1966 the band has earned those accolades and still command the respect of the music industry. Tonight’s performance in the fine accoustics of the historic auditorium at ECA was a delightful trip down memory lane. The audience had obviously been concert goers for decades. Nearly every person in attendance (with the lion’s share over 55) did his or her own style of appreciation be it foot tapping, hand clapping or engaged in the classic ‘sitting body rock’. OK, maybe not everybody, but I sure had some good memories of concerts past. From organ to honky tonk piano and everything in between, Bob Carpenter brings a diversity of sounds from his keyboards that have you wondering where the sounds are originating. Jeff Hanna’s vocals are truly powerful in effect. Guitar playing? Hanna shows his skills across several styles of guitar work and blends with the other instruments perfectly. Jimmie Fadden is a classic and superb drummer. I would challenge anyone to name a musician who can get as much out of a harmonica as Fadden can. John McEuen’s work on guitar, mandolin, steel guitar, fiddle and 5-string banjo is at times unbelievable. You won’t find a better 5-string picker than McEuen. The playlist tonight was classic NGDB as you would expect. “Face on the Cutting Room Floor” was played early in the show with reference to the late John Goodman given. The band gave a moving version of “Dance Little Jean” one I had not heard for a long time. The instrumental solos offered by each of the men during the playing of “Ripplin Waters” was one of the highlights for me. I really got a kick out of the NGDB version of the Beatles “Get Back” with a 5-string banjo. And of course “Mr. Bojangles” was appreciated by all. John McEuen was brilliant in his monologue and presentation of “The Ballad of Jed Clampett”. He successfully had an entire crowd of boomers singing along with him as he reminded us all that we would have to explain the ballad to our kids and (gasp) grandkids. Don’t miss an opportunity to see NGDB in concert. This was one of those events that Sher and I can say we were glad we attended. This was a great concert in a great venue.